Win a Grovia Cloth Diaper Shell and Prefolds in this week's giveaway! 8/25/17 FYSF, Win a GroVia Cloud Shell and THREE Newborn Prefolds! This week's FYSF features one of our favorite mainstream cloth diaper brands! 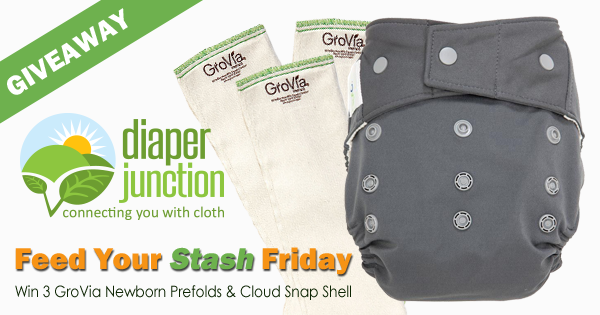 Enter to win a GroVia Cloud Snap Shell and three Grovia Newborn Prefolds! Prefolds and covers are among the most affordable diapering methods and because GroVia is a hybrid diaper system you'll also be able to use this diaper shell with GroVia's snap-in soakers OR their disposable inserts! One lucky winner will receive a OS Snap Shell in Cloud and three Newborn GroVia Prefolds. This contest is open to the USA & Canada. The winner will be contacted by email and will have 7 days to reply and claim their prize. Must be 18 years or older to win. I love GroVia diapers! They have made cloth diapering much easier for me. I don't have any grovia but i have tried one and love it. I do not own any Grovia's but hear good things about the diapers.